00:45:00 Makes 15 servings, 1 chicken cake (50 g) and 1-1/2 tsp. (7 mL) sauce each. Makes 15 servings, 1 chicken cake (50 g) and 1-1/2 tsp. (7 mL) sauce each. Combine chicken, onions, cream cheese, 1/3 cup nuts, herbs and zest. Roll into 15 balls; flatten to 1/4-inch thickness. Dip in flour, turning to coat both sides of each patty. Gently shake off excess flour. Heat oil in large deep skillet on medium-high heat. Add half the chicken patties; cook 3 to 4 min. on each side or until done (175ºF) and golden brown on both sides. Drain on paper towels. Repeat with remaining patties; cover to keep warm. Mix next 6 ingredients and remaining nuts in saucepan; cook 3 to 5 min. or until sugar is dissolved and sauce is slightly thickened, stirring frequently. Cover large plate with basil leaves; top with chicken cakes. Drizzle with sauce. Prepare using 1 lb. (450 g) ground turkey. 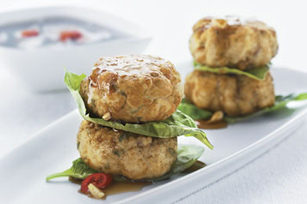 Serving Size Makes 15 servings, 1 chicken cake (50 g) and 1-1/2 tsp. (7 mL) sauce each.